The hand & wrist has a very delicate and complex structure, which allows muscles and joints a great range of movement and precision. The different forces are also distributed in the hand in the best possible way. But the hand and wrist are also quite vulnerable: tendons, nerve fibers, blood vessels and very thin bones are all positioned right under the skin and are only protected by a thin layer of muscle and fat. Only the palm is protected by a strong pad of tendons (aponeurosis) for a powerful grip. Our hands are put through quite a lot day in and day out, and are often within range of dangerous tools. This makes hand and wrist injuries and problems due to wear and tear very common. Carpal tunnel syndrome is a progressively painful hand and arm condition caused by a pinched nerve in the wrist, the median nerve. A number of factors can contribute to this such as the anatomy of the wrist, underlying health problems and patterns of hand use. The carpal tunnel is a narrow passage way about as big around as your thumb on the palmar side of the wrist. The tunnel protects a main nerve to your hand and 9 tendons that bend your fingers. Compression of this nerve produces numbness, pain and eventually hand weakness and loss of coordination. Carpal tunnel can be treated with conservative measures. If the conservative measures do not cure the problem, surgery to release the ligament compressing the nerve is done. Carpal tunnel symptoms may start as a vague ache in the wrist that can extend into the hand or forearm. Common symptoms are numbness and tingling in the fingers especially the thumb, index, middle or side of the ring finger. Symptoms are common at night when you may sleep in a position that is awkward for the wrist, specifically flexion, or bending it down. It can also happen as you are holding the phone, steering wheel or newspaper. As the condition progresses, you can actually start dropping things due to lack of coordination in the hand. Following a period of time where you have been actively using the hands for repetitive tasks, such as sewing, knitting, gardening or typing, symptoms can worsen and radiate symptoms down the fingers or up into the shoulder. It is important to treat this condition to prevent its progression. Treatment is frequently with splinting and avoidance of activities that provoke the symptoms because if ignored, it can lead to permanent loss of sensation and strength in the hand, especially the thumb. We see patients with CTS to advise how they may decrease symptoms and post-operatively to restore hand movement, strength and dexterity. You may find yourself waking up at night with numbness and shaking your hands to wake them up. Poor sleeping positions with the wrists bent can aggravate CTS. Anything that crowds the nerve in the carpal tunnel can bring on symptoms such as following a wrist fracture or swelling from an inflammatory joint disease such as rheumatoid arthritis. It is usually caused by a combination of risk factors such as anatomic factors, which is why it is more common in women that have a smaller circumference of the carpal tunnel. Conditions that damage the nerves such as diabetes and alcoholism increase the susceptibility of the nerve to pressure. Inflammatory conditions may cause swelling in the tendons which can also decrease the size of the carpal tunnel and increase the risk of having nerve symptoms. If you have a change in the balance of body fluids that occurs in pregnancy, menopause, obesity and some thyroid disorders, or kidney failure you may increase the pressure within the carpal tunnel. There are also workplace factors, such as working with vibrating tools and activities that require prolonged repetitive wrist bending may increase the pressure on the median nerve. One thing that we as physical therapists can do is recommend a wrist splint. A P.T. can also help individuals by identifying activities that provoke symptoms and make recommendations on how to change what they are doing in order to avoid increase in symptoms. Non-steroidal anti-inflammatory drugs can relieve pain from carpal tunnel but there is no evidence that they actually correct the condition. Occasionally a steroid injection into the carpal tunnel can reduce the swelling and inflammation and cause symptoms to improve. If symptoms persist, surgery is a good alternative, depending on the surgeon it may be done through a scope or can be done with a small incision in the palm to release the transverse carpal ligament and, thus the pressure on the nerve. One of the best ways to relieve the pressure in the carpal tunnel, since many times it starts at night, is to change the sleeping position to keep the wrist neutral, either with wrist splints or by changing the position you sleep in. Wearing a wrist splint can be helpful, taking breaks periodically from repetitive hand activities, reducing forceful use of the hands, and using less force when working with tools can be of help. Improving overall posture can be helpful keeping the head up and the shoulders back so you don’t compression the nerves proximally at the neck level. Keeping the hands warm can also reduce symptoms. This occurs at the level of the elbow where the ulnar nerve travels through a tunnel and can be compressed. The ulnar nerve is one of the three main nerves that go to the hand. We have already discussed the median nerve that can be compressed in carpal tunnel. You may have banged your elbow before and have a shooting sensation down to the fingers and they call it “hitting your funny bone”, that is the area where the ulnar nerve is superficial at the elbow. This nerve goes to very important muscles that provide strength and dexterity in the hand and also sensation to the little finger and half of the ring finger. Although the ulnar nerve can get compressed in the hand or under the collarbone it most commonly occurs at the elbow. You would be predisposed to this condition if you have had a prior fracture around the elbow, bone spurs or inflammatory joint condition, such as RA that causes swelling around the joint or if you do repetitive activities such as bending and straightening the elbow or put pressure on the elbow for a long period of time. Pressure on the ulnar nerve can give the feeling of falling asleep of the little finger and half of the ring finger. The sensation is similar to carpal tunnel but on the other side of the hand. As the condition progresses often times weakness in the hand and difficulty with finger coordination can occur. Prevention and treatment are very closely related. In order to prevent this from reoccurring or treat it once it has occurred, avoid frequent use of the arm with the elbow in a static bent position and avoid repetitive bending and straightening of the elbow. If you are sitting at a computer, make sure that the chair is not too low so you don’t have to bend your elbow too much when using the computer. Avoid leaning on your elbow and putting pressure on the nerve. Try to keep the elbow straight during the day and especially at night when you are sleeping by using a splint or if you can position yourself and stay in that position that may work well. Sometimes in physical therapy we give splints for sleeping at night and also an elbow pad that will relieve the pressure if you put the elbow down on a hard surface. If no treatment is helpful, you may undergo surgical release of the cubital tunnel, which involves surgery at the elbow in taking the top off of the cubital tunnel and release of ligamentous tissue to prevent compression. Physical therapists may see patients post op to help restore mobility and strength and return people to their previous work and leisure activities. ​DeQuervain’s tenosynovitis is a painful inflammation of the tendons on the thumb side of the wrist that go down the thumb. Activities that involve repetitive use of the hand or the wrist especially in a fisted position and moving the wrist side to side can aggravate the condition. Using a computer mouse can add to the discomfort. The main symptom of the DeQuervain’s is pain at the base of the thumb that can come on gradually or it may appear suddenly. There may also be accompanying swelling at the base of the thumb. Associated with this is difficulty moving the thumb and wrist when doing activities that involve grasping or pinching and you may even get like a sticking sensation in the thumb when you try to move it. At times there can be a squeaking like a rusty hinge sound with when you try to move the thumb and wrist. Treatment for this like many of the other painful conditions in the hand involves avoiding repetitive thumb movements if you can and avoid using the thumb as you are moving the wrist from side to side, apply ice, use non-steroidal anti-inflammatory medication and sometimes you can immobilize the wrist and thumb with a splint. Your physical therapist usually can identify the provocative activities the individual is doing and advise them to stop them as much as possible. It is recommended that patients take anti-inflammatory medication if their doctor advises them that they can tolerate these, apply ice to the area and if this doesn’t take care of the problem, they may need a splint to immobilize the wrist and thumb during the day and at night. The two tendons that are involved run together in a sheath that has fluid in it and sometimes the sheath becomes inflamed and restricts the movement of the tendons. It can be caused by direct injury to the wrist or tendon or may be scar tissue build-up that restricts movement of the tendons. An anti-inflammatory condition such as rheumatoid arthritis can put you at risk for DeQuervain’s. The people who are at risk for this condition are usually people in the 30 to 50 year old age bracket more commonly females and individuals that their hobbies or their vocation involves repetitive hand and wrist motions such as carpenters, office workers and musicians. If the condition does not get better with splinting and non-steroidal medication or ice, then see your physician and he may recommend outpatient surgery where the sheath may be released surgically to relieve the pressure on the tendons. Physical therapists are involved pre-operatively to recommend splints and modalities to reduce pain and inflammation and post-operatively in advising patients how to gradually restore function and return to their normal leisure and vocational activities. ​DeQuervain’s is French word and so is Dupuytren’s. These two conditions are named after French physicians. A Dupuytren’s contracture is a condition that develops over decades and it affects the connective tissue under the skin of the palm. Over time, knots of tissue and bands form under the skin and thick cords develop that actually pull down the finger and that is why it called a contracture. The fingers are pulled down and can’t be straightened out. This can be problematic and complicates daily activities such as putting your hand in your pocket, putting on gloves or even shaking hands. Dupuytren’s most commonly affects the ring and little fingers but can also affect thumb and other fingers. Early on it just appears as thickening of the skin on the hand but as things progress the palm and hand can actually appear puckered or dimpled. No one really knows what causes Dupuytren’s but it does tend to run in families. Dupuytren’s is found in someone over the age of 50 and is more common in men than women. People of northern European descent are at higher risk of the disease and again there is a familial background to it. Using tobacco and alcohol is associated with an increased risk of Dupuytren’s. This may be due to the microscopic changes within the blood vessels caused by smoking. People with diabetes also have an increased risk of Dupuytren’s. Once the fingers are contracted, it may difficult to use your hand normally but as it progresses it can limit your ability to open your hand and make it difficult to grasp large objects and get your hand in narrow places. Most patients decide when they are tired of putting up with the problem and they see their physician and work with the physician on a plan for possible surgical release of the contracture. Surgery is tricky since there are so many fine nerves in the palm of the hand that need to be avoided when the tissue is cut away. Following surgery patients often have physical therapy to restore movement of the fingers and for splinting to see that the contracture does not recur. The Food and Drug Administration has approved injections of an enzyme for treatment of Dupuytren’s contracture. With this treatment the injection is done and the next day the surgeon will manipulate the hand to stretch out the cords. For prevention of Dupuytren’s the best thing you can do is protect your hands, do not use them as weapons or as tools. Sometimes cushioning some of the tools that you use is less traumatic to the palm. Keeping the fingers and palm stretched out straight and applying heat and massage prior to stretching the fingers out can be helpful. Progressive splinting has also been helpful in some cases. The hand is vulnerable to infection because of the tools and utensils that it comes in contact with that can be damaging to the tissue and the dirty environments where hands often spend much of their time. Finger injuries are serious because they can affect the function of the whole hand and just not that finger, since the tendon systems are interrelated. It is very important to get medical attention and get these things taken care of by a hand specialist. Infections can be very serious in the hand especially if you have an injury right over a joint. Animal and human bites can introduce bacteria into a joint and it can worsen very quickly. These types of injuries often do not get better without antibiotics. In severe cases when the infection is deep within the hand it may have to be cleaned out surgically. Bacterial infections that are not treated can damage the tissue around them and spread quickly. Jammed finger is sometimes referred to as stoved finger. These injuries typically occur around the proximal IP joint or the middle joint of the finger. Many times people think that they just have involved the tip of their finger and it is a minor problem and it will get better in a couple of days or a week and this can be the case but there can be some serious problems that occur as a result of this injury as well. Injury to his joint is common in athletic activities especially ball handling sports and is often minimized by players and coaches. The anatomy of this joint is very complex and there are a lot of structures that can be damaged. If you have a disruption of the tissue in the palmar side of this joint that needs to be addressed and also fractures can occur. Some of these fractures are not stable which means that the bones move. Any stoved finger that is not responding in a couple of days to ice and moving it should be followed up with a physician. You could have an injury to the ligaments on the side of the joint, which is something that should be addressed because these can develop a lot of stiffness, as they get better. Following an injury to a finger joint, if there is significant swelling and difficulty bending or moving, it is always a good idea to get an x-ray first and let a physician examine the finger and make recommendations. You have to make sure that your tendons are functioning and don’t have a rupture to one of the tendons that should be repaired within a week. Raynaud’s disease is a condition that causes certain parts of your body like the tips of your fingers or toes, tips of nose or ears to feel numb and cool in response to cold temperatures or stress. This is caused due to the narrowing of the small vessels that supply blood to these areas. Women are more likely to have Raynaud’s than men and of course it is common in people who live in cold climates. For most people it is more a nuisance than a disability, but still it is nice to know what problem you have. The symptoms of Raynaud’s are cold fingers and toes and you see a sequence of color changes from white at first and then the affected areas may turn blue, feel cold and numb and sensation is decreased. As the circulation improves and the limb warms up the affected areas turn red and may throb, tingle or even swell. Raynaud’s is not completely understood, but it does appear that the blood vessels in the hands and feet over react to cool temperatures or stress. Since stress can also cause a constriction of the blood vessels in the fingers and toes. Attacks are triggered most commonly by cold temperatures as simply as putting your hand in cold water. Raynaud’s can occur without any underlying cause but is also fairly common with diseases such as Lupus and Rheumatoid arthritis. It can also be associated with diseases that affect the arteries. Patients with carpal tunnel can be more susceptible to Raynaud’s and also people who have repetitive trauma to their hands and they actually damage the distal blood vessels. Smoking constricts blood vessels and is a potential cause of Raynaud’s and at the very least a worsening factor. Some medications that you may take for your blood pressure, your heart or migraine headaches may also aggravate this condition, so if you do have the condition discuss it with your physician. Raynaud’s is more common in females, females living in cold climates and if you have a first degree relative, parent, sibling or child with the disorder it is more likely you will have it as well. If the condition is very troublesome, you physician may recommend medications that may act as vasodilators to dilate the vessels and increase the circulation. The best things you can do to prevent Raynaud’s is don’t smoke, exercise regularly to increase circulation in small vessels, try to control your stress since that may trigger an attack, avoid caffeine because caffeine is also a constrictor of vessels. It is helpful to take excellent care of your hands and feet so they are not traumatized and no injury to the vessels occurs. Avoid cold climates and if you are in a cold climate wear gloves. In a situation where you are symptomatic what you can do is do a wind mill exercise where you make your arms go around and it pushes the blood down into the fingers or put your hand under your underarms and wiggles your hands and toes and run warm water over them, but not hot because your sensation may be compromised so you won’t be able to feel it if you burn yourself. Trigger finger is a condition where one of your fingers or thumb catches in the mid position and it may straighten with a snap. Many times it is painful when this occurs. It is caused as a result of narrowing around the tendons in the sheath that over time may develop bumps or nodules. The nodules may get hung up under the pulley system in the hand. 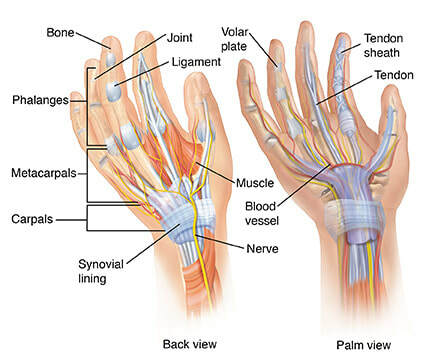 The pulley system works to make the tendons system work more efficiently. It is a more common condition in females and people who perform repetitive activities. It is more common in people who have diabetes and also those with inflammatory conditions such as Rheumatoid Arthritis. To prevent trigger fingers avoid provocative activities, which in this case, are repetitive activities especially when you are actually compressing the fat pad in the palm using tools, squeezing too hard or not wearing well padded gloves when you are using tools. Treatment can be resting the hand and avoiding repetitive activity, warm soaks and splinting the finger into extension especially at night. The next step would be non-steroidal anti-inflammatory medications and possibly even a corticosteroid injection close to the tendon sheath. If this doesn’t work surgery can be performed where the pulley is released so the tendon glides without being restricted by the pulley. This can occur in multiple fingers once you have trigger finger. Look at what you are doing it may be aggravating it and try to stop. If you don’t know what may be causing it talk to your doctor or your physical therapist and they can advise you about proper padding of the palm, wearing of gloves, splinting as well as other treatment options. ​The joint at the base (basal joint) of the thumb is the most common joint in the hand to develop osteoarthritis. This occurs when the cartilage that cushions the adjoining bones forming the carpometacarpal joint wears away. The most common symptom of thumb arthritis is pain that occurs at the base of the thumb when you grip, grasp or pinch an object between the thumb and index finger or use the thumb to apply force, such as buttoning a shirt, pulling on a zipper or attempting to open a bottle or jar. As the condition progresses there may be swelling and stiffness at the base of the thumb, decreased strength with pinching or grasping objects, decreased mobility or a bony lump at the base of the thumb. The condition is most common in women, those over 40, especially with hereditary conditions that cause loose joints. Other risk factors are an injury to the joint, performing a job or daily chores that put high stress levels on the thumb joint and other hereditary conditions that affect joints such as Rheumatoid Arthritis and Lupus. Your doctor or hand therapist can recommend a combination of treatments, such as self-treatment techniques, activity modification, splints, medications and physical therapy. Conservative treatments or cortisone injections are usually effective, but in severe cases there are surgical techniques that are helpful. The technique chosen is usually the surgeon’s preference. It is important to keep the thumb joints mobile and to modify hand tools and utensils with larger and softer handles to reduce the stress on the joint. Replacing doorknobs with levers can be very helpful. Using rubber mats to open jars and bottles are recommended as well as reducing the force you use while grasping and pinching. ​Hand therapists have a complete program of joint protection techniques and recommendations for splinting and reducing pain.